Many people are looking for a way to burn photos to slideshow so that they can save their sweet memories for a long time. Create Photo Blu-ray slideshow will be the best choice. However, there are plenty of Blu-ray DVD burners available, but some burners are not always up to scratch due to the questionable quality of the final product or ease of use. To choose the best Blu-ray creator you need to have a strong understanding of the product and what it is capable of. But it is difficult to visit every website and examine every Blu-ray burner. To address this issue, we have examined the best Blu-ray creators on the market to find the best one for you. We assess the creator of Blu-ray DVD's based on several factors like quality and ease of use. 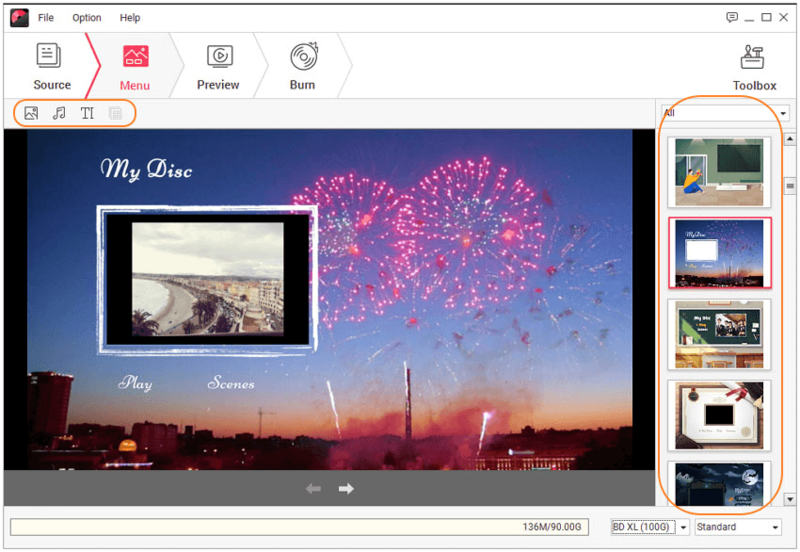 Wondershare DVD Creator lets you create high-quality Blu-ray slideshows in moments. This Blu-ray creator freeware combines your desire for ravishing aesthetics with efficient, time-saving technology. As parents, professionals and university students we must always make the most of our time. Wondershare understands your time is precious which is why the DVD Creator with efficiency in mind. You will not find another software suite that creates high-quality DVD slideshows quickly and efficiently. Wondershare DVD creator is excellent not only because it's secure and safe for your computer, but also has great customer support. If you have any questions about using the bluray DVD burner you can contact one of the customer representatives for questions. Burn pictures and videos to DVD/Blu-ray/BDMV/ISO file. Burn photo files to Blu-ray disc from phone or camera directly. Built-in editor tool to crop/trim/rotate videos, add effect/text/music on photos or videos, and help with other settings. 100+ free static and dynamic DVD templates from Family Life, Sport to Holiday theme. Customize DVD menu by changing background image, adding title thumbnail, creating chapter and more. 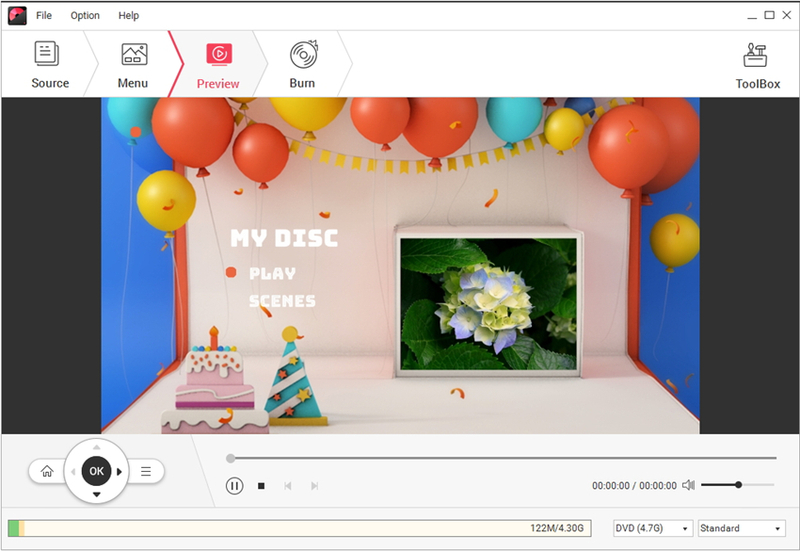 Toolbox with more functions of burning data disc, ISO to DVD, video/photo editor, DVD to DVD, DVD/Blu-ray disc to video, One-click to burn videos to DVD, etc. Supported OS: Mac OS 10.14 (Mojave), 10.13(High Sierra), 10.12, 10.11, 10.10, 10.9, 10.8, 10.7, 10.6, Windows 10/8/7/XP/Vista. First of all, download a free trial version of Wondershare DVD Creator via the download button above. Install and open the program, choose Create a Blu-ray(BDMV) Disc option. Click on the " + " button under the Source tab to add the photos you want to make a slideshow. Alternatively, you can just click and drag all your files into the Blu-ray DVD burner. All added photos will be displayed as thumbnails on the left side. Click on the pencil-like editing icon on the thumbnail, you'll get a pop-up Slideshow Maker window where you can edit the photos by adding text, changing background music, applying effects, setting transition and more! You can also adjust the Brightness, Contrast, Saturation of the picture. Now go to the Menu tab to customize the menu of your new DVD. All the templates are listed on the right-hand side. Double-click to choose one or click Download button to load more suitable templates. If you want to further customize the photos to Blu-ray disc menu with music, text, or background image, just hit the corresponding icons on the left-top of the interface. Switch to the Preview tab to check your photo to Blu-ray creation. If you're not happy with it, don't get mad, just back to the previous tabs to make changes. Finally, hit the Burn tab, choose Burn to disc or Save as BDMV folder based on your needs. Complete the rest Burn Settings in terms of Disc label, bnurner, Encoder, Resolution and others. Finally, click Burn to start burning photos to Blu-ray disc. Before getting started, you can download and install a free version of the Blu-ray creator MAC at the ImgBurn official website. Step 1: Launch ImgBurn, you will get a menu with several options. Choose Write files/folders to disc. Step 2: Choose the right folder on the Bluray burner. And then click on Browse for a source folder > Add BDMV folder and certificate folder. All folders will be stored in the source box. Your window should now look like this. Step 3: Switch to the Options, go to File System and choose UDF. After that, set UDF Revision to 2.5. Step 4: Add the disc into the disc driver and set it as the destination folder. Step 5: Click on the Build icon. The Blu-ray disc burner will now burn the files onto the DVD. Wedding Slide Studio is an all-around, versatile Blu-ray creator software. As the name suggests, the creator is designed specifically for those who have plenty of wedding photos. The creator lets you repackage all your wedding images as a high-quality slideshow. Also if you have birthday images, family outings, picnics, class trips, Thanksgiving dinners, Christmas and any other occasion. Step 1: Click on ORGANIZE PHOTOS. Drag your photos from your computer to the window. The Blu-ray creator has 4 sub-menus allowing you to change the presentation to suit your style. Album Photo: It lets you freely add, remove or edit photos by changing the brightness, set album thumbnail, arragne photo sequences, add subtitle, apply special effects and more. Transition and Music: It enables you to add any background music from local computer or load from a CD through a built-in Audio Ripper. 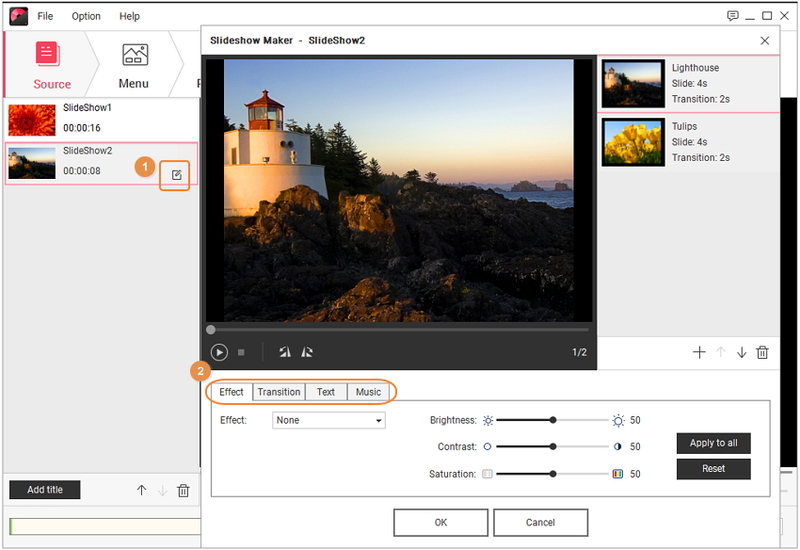 You can also adjust photo transition effects, customize sound effects and trim music to your favorite clips. Album Theme: It empowers you to edit the album by adding title pictures with effect, duration and background settings, which includes the theme, the beginning and the end part. Album Preview: It allows you to preview the album before moving to the next stage. Step 2: You can custom create menus with the Blu-ray DVD burner. Select CHOOSE MENUS tab to choose a menu template for the Blu-Ray. You can customize the background music, image, font style, size and color. Step 3: After making all these changes, click on Burn Disc tab. Insert the CD into the Drive and select Output Format. Choose Blu-Ray Disc and click Burn Now button to start the DVD burning process. We compare the three Blu-ray disc burners to decide best Blu-ray creator. To choose the best Blu-ray creator software you have to give due diligence to factors like quality, features, and accessibility. Choose the best Blu-ray creator based on the scope of your ambition and how much free time you have. All three options mentioned above are excellent picks for anyone.